The founders of DreamHost, as well as the company itself, have been actively working hard to improve the open-source community for quite some time. The host has now become a popular choice among the WordPress community, but how well do they do at optimizing their services for the Internet’s largest content management system? 19 Who is This Host for? DreamHost was founded by four friends in a college dorm in 1997. They shared a love for technology and open-source software and found a way to turn their passions into careers. 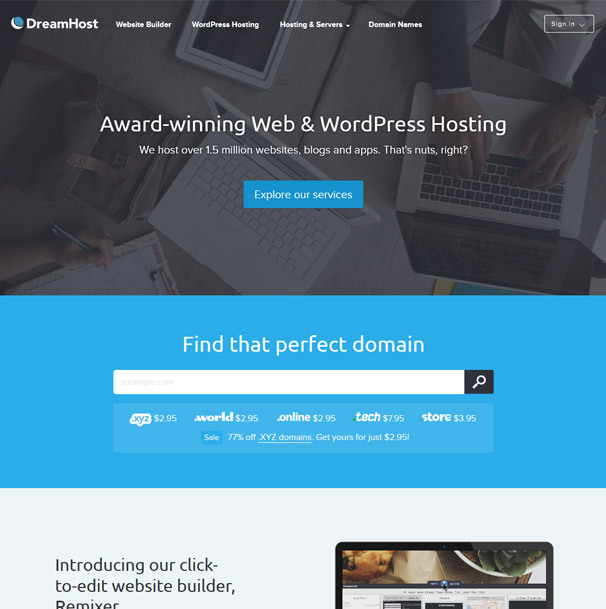 Today, DreamHost hosts over 1.5 million websites built by over 400,000 web designers, developers, content creators, small business owners and entrepreneurs in over 100 different countries. They’re a multi-level host, which means they offer a variety of different server types ranging from typical shared hosting environments to scalable cloud hosting environments. They’re also a multi-application host and support such applications as WordPress, Joomla, Zen Cart and phpBB. DreamHost offers a simple pricing model for its shared hosting service, but that’s not necessarily a good thing. More on that in the cons. It also offers a 97-day, money-back guarantee, which gives you three whole months to decide whether or not this is the host for you. Use our Dreamhost Coupon to get Shared hosting for just $5.78 per month. This is one step above shared hosting. Your website, as its name suggests, shares a server with other websites in a shared hosting environment. Managed WordPress hosting works as a VPS solution in that your server is installed in an isolated area of a shared hosting environment. You’ll get a free domain if you pay annually. Here’s where things get amped up. VPS hosting is still shared hosting, as stated before, except your website exists in an isolated environment in which websites are not able to drain resources from other websites. Both plans support an unlimited number of domains and bandwidth. 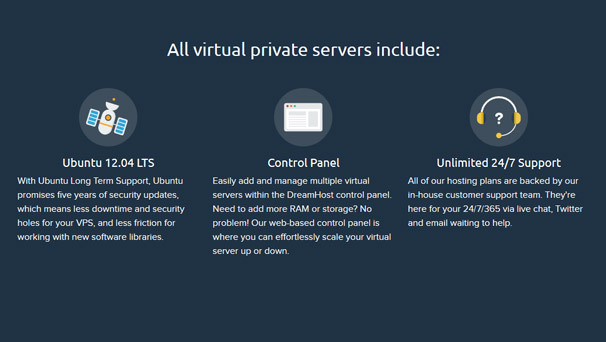 You can also add an optional MySQL VPS server to your plan, which gives your database its very own server. DreamHost offers support 24/7, and all of its support agents are employed by the company. None of them are outsourced from low-quality services. 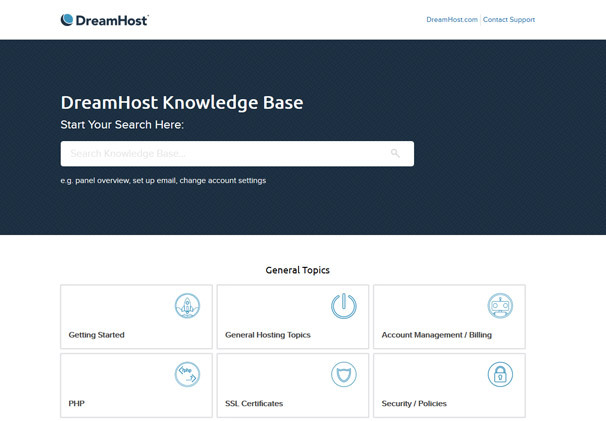 You can contact support through the DreamHost Control Panel. Unfortunately, phone support is not available. DreamHost also has a status page you can refer to if your website goes down and you aren’t sure what the culprit is. You can also get help from the knowledge base or community forums. There are many advantages and disadvantages that come with hosting with DreamHost, but we’re going to take a look at the advantages first. 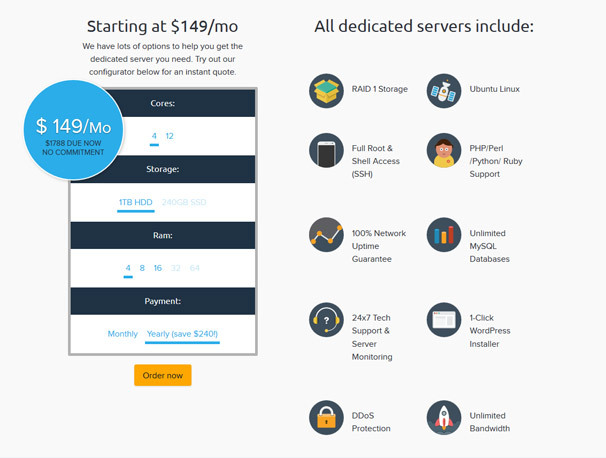 DreamHost’s shared hosting and managed WordPress hosting plans offer simple pricing, and they even allow you to pay on a month-to-month basis while most hosts make you pay for a year upfront at least. DreamHost offers its very own CDN service. It’s not free, but it is pretty cheap. It costs $0.12/GB in the United States and Europe and $0.19/GB in the Asian-Pacific and Oceanic regions. There are no monthly commitments. DreamHost partners with a number of different services to offer its customers more without all the hassle. This includes such popular services as Cloudflare, WordPress and OpenStack. DreamHost offers several levels of security. This includes DDoS protection, a built-in malware remover, free SSL certificates through Let’s Encrypt, free domain privacy protection, HTTP/2 for nginx offerings and mod_security as a firewall for Apache. Here are the disadvantages of using DreamHost, as promised. 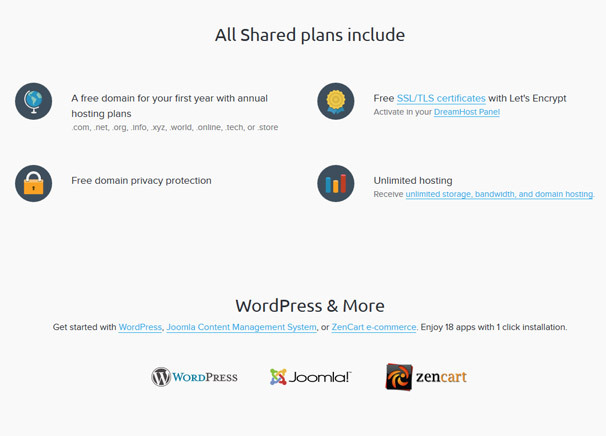 DreamHost’s pricing for shared hosting and managed WordPress hosting are simple, but they can be too simple for some. Some users, such as first-time bloggers, don’t need the power of a server capable of hosting an unlimited number of websites when they’re first starting out, and yet, they’ll be expected to pay for it if they choose DreamHost. You also can’t move up if your site begins performing poorly. 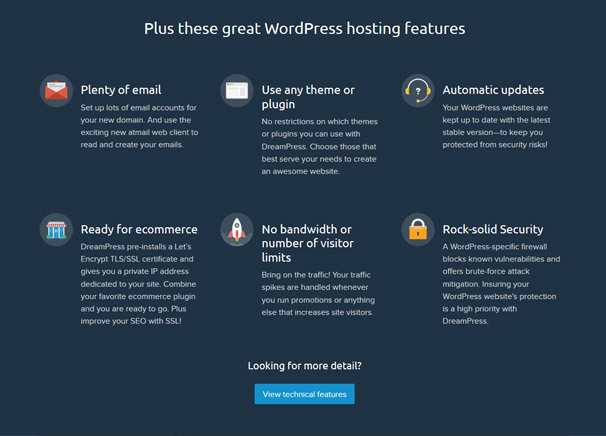 Your only option is to upgrade to managed WordPress hosting if you’re on shared hosting and VPS hosting if you’re on managed WordPress hosting. DreamHost doesn’t use cPanel as most hosts use. Instead, they use their very own system called the DreamHost Control Panel. It does all of the same stuff, but it requires users to learn an entirely new system. DreamHost doesn’t offer different tiers for its shared hosting or managed WordPress hosting plans, but it still would be nice to know how much traffic each type of hosting is capable of supporting. This would allow you to make an educated decision of what type of server to host your website on. DreamHost offers very few features for developers. There’s no WP-CLI inside of WordPress, no staging feature and a lack of support for popular applications, such as Magento, OpenCart, and PostgreSQL. This host is for bloggers, entrepreneurs, small businesses and enterprises, to put it simply. However, because this host only has one shared hosting plan and one managed WordPress hosting plan, I can only recommend this host for medium-sized bloggers and above. A $10/month server capable of hosting an unlimited number of websites is overkill for small bloggers who don’t plan on growing quickly. You’re better off going with a host that offers several shared hosting plans with the cheapest being a few bucks a month. This host is also for developers looking to resell hosting plans to their customers. This, as mentioned before, is offered in the fully-managed dedicated hosting plan. Do the above descriptions match what you’re looking for in a host? Click the link below to give DreamHost a try and receive a discount of up to 50% as well as a free domain with your order. Thanks for the review article on Dreamhost, Very useful and I did learn some useful stuff! Thanks for this review as you have mentioned if you’re managing something like a web server you need to have access to all the data you can get your hands on. This is why I have a hosting provider that gives my access to my statistics from within my control dPanel. I can see how much of my RAM is used, and how much CPU power am I draining. I get a graph that represents my usage in the dhosting.com user panel, and I know exactly right after I make a website modification if my performance decreased or increased.